The nights of December 9 and 10, 2009 were very special ones at New York’s famed Birdland. Four jazz legends came together those evenings to play in a strictly old-school format. They were working without a net, or to be more precise, without a set list. It takes a lot of talent, not to mention guts, to get up onstage and just call the tunes on the spot. With these players, talent and confidence are in no short supply. The four in question are Lee Konitz (alto sax), Brad Mehldau (piano), Charlie Haden (double bass), and Paul Motian (drums). Manfred Eicher was on hand to record the proceedings, and ECM have just released the results as Live At Birdland. The six tracks that constitute the disc all top the ten-minute mark, which allows ample room for improvisation. To hear four musicians of this caliber play together the way they do is a marvel. Live At Birdland is one of those records that will make a true believer out of even the most doubting Thomas. The program commences with "Lover Man." The ballad is most closely associated with Billie Holliday, although many others (including Konitz) have recorded versions of it. 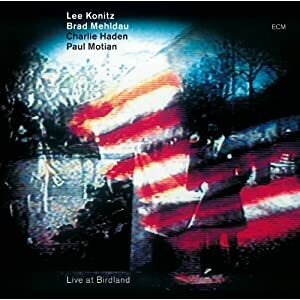 Lee Konitz’s sax takes the lead, followed by a perfectly nuanced solo from Brad Mehldau, with the rhythm section holding steady. "Lullaby Of Birdland" was written by the recently deceased George Shearing in 1952, and has served as the venue’s very own theme song ever since. Reportedly the 83 year old Konitz is the only living jazz soloist to have played at every address Birdland has called home since opening in 1949. Including this classic in their set was an excellent choice, and it sounds as hip as ever. Miles Davis played his fair share of gigs at Birdland over the years, so including his "Solar" seems a natural. This has always been one of Davis’ most exemplary hard-bop outings, and to hear this group play it is a treat. The interaction between Konitz and Mehldau during the opening is spellbinding, while Motian’s drum solo at the end caps things off perfectly. "I Fall In Love Too Easily" finds us back in ballad territory, courtesy of composer Jule Styne. Frank Sinatra made this song his own back in 1945, and this quartet find the tune’s core in their nuanced way. Watch for the intriguing Ornette Coleman-inspired stlylings from Konitz towards the close. Interestingly enough, the trio of Konitz, Mehldau, and Haden recorded a version of "You Stepped Out Of A Dream" for Blue Note back in 1997. Here they add the drums of Paul Motian to produce a much different sound. The final track is Sonny Rollin’s "Oleo," another bop classic. On this track the quartet let out all the stops and come up with a highly memorable rendition. Pay particular attention to the closing of this 15-minute cut - all four are soloing madly, and yet were able to hold it together perfectly. Live At Birdland is a great set of music from four legendary jazz musicians and definitely worth a listen.